I realize that I just ignored a few of you who waived their hands adamantly in protest of another pumpkin recipe. But keep reading (please?) because there’s something for you here too. Soup is one of my very favorite things to make. 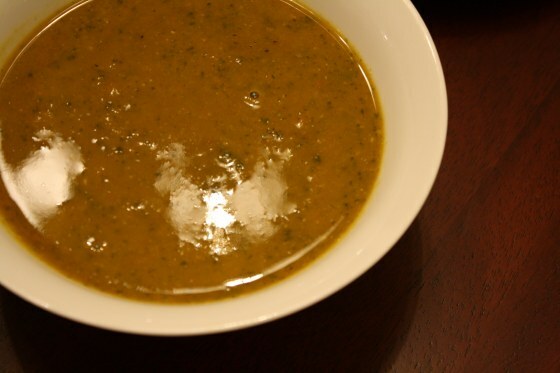 Almost any vegetable that you don’t like can be masked in a soup. 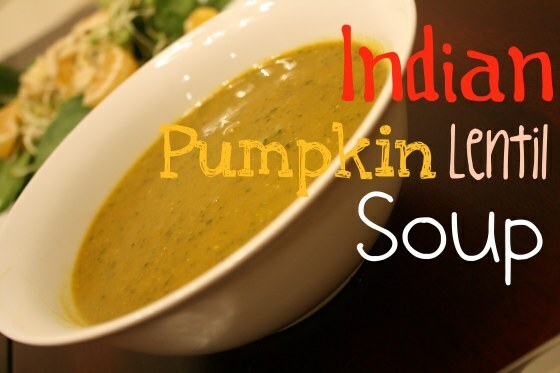 Almost any taste you’re craving can be created with a soup. Sweet? I’ve got you covered. Meaty? Well, there you go. Okay, chili isn’t technically a soup, but it’s close enough. And who doesn’t love something creamy and steaming hot when the weather is anything but? In a large pot bring the lentil to a boil in the vegetable broth with the bay leaves. Allow to simmer for about 30 minutes so that lentils are very tender. Meanwhile, in a large skillet or pan, melt coconut oil over medium high heat. Add onion and garlic and allow to soften (~5 minutes). Add carrots and allow to cook another 5 minutes. Lastly, add bell pepper and cook an additional five minutes. Turn heat to medium if onion begins to darken beyond a caramel color and stir often. Remove bay leaves from lentils and broth. Add cooked vegetables and spices. Add more salt according to taste, if needed. Add spinach and stir. Allow soup to cook for at least 15 additional minutes. Puree the soup using an immersion blender or a food processor. Serve steaming hot. *I used tatsoi, which just goes to show that soup can mask the flavor of almost any yucky vegetable. …that is unless you pair it with soup…. …or top it with clementines. 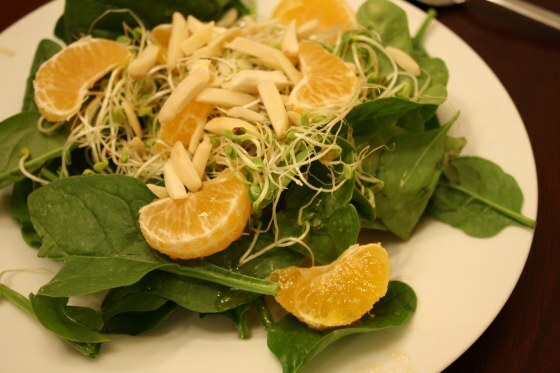 Distribute spinach among two salad plates. Layer half the sprouts on each of the plate. Peel one clementine and pick apart the segments. Cut the other clementine in half and peel only one half and pick apart the segments as well. Reserve the unpeeled second half. Top with the orange segments from 1 1/2 clementines. Top each plate with half of the almonds. Take the reserved clementine half and squeeze juice into a small bowl (~2 tablespoons). Add vinegar and oil to the bowl and whisk. 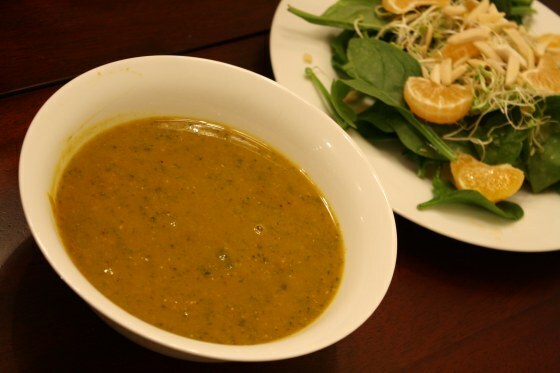 Pour half of the vinaigrette over each salad and toss to coat. 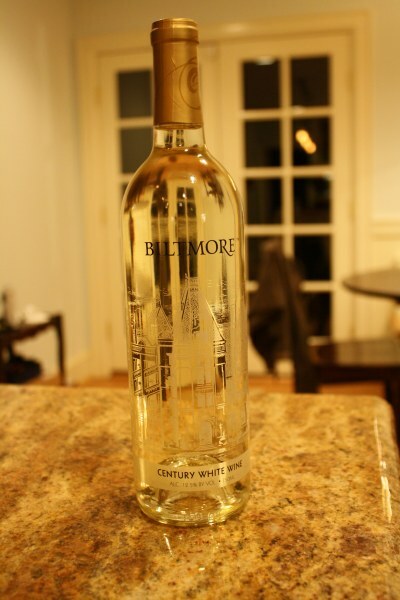 With our meal, Brad and I enjoyed Biltmore Century White Wine, which is a blend of slightly sweet wines like Riesling and Gewurztraminer. Brad absolutely loves it and I actually like it too, even though sweet wines usually aren’t my thing. We picked up this bottle at Native Vine Tasting Room after sampling a bit. There, I learned that Riesling actually goes very well with Thai food. I was a bit surprised but glad to learn this tidbit of wine knowledge after completely ruining a good bottle of dry white by pairing it with Thai food in the past. I figure, if a slightly sweet Riesling goes well with Thai, a Riesling blend probably goes well with Indian too. Curry is curry, right? I’m no expert, but I thought this wine complimented our meal very well. You know what else complimented our meal? 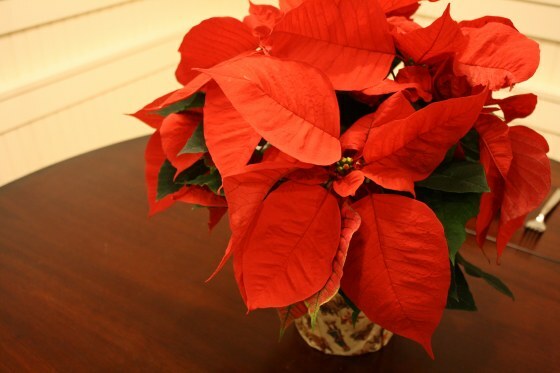 The poinsetta I picked up at Trader Joe’s. My mom is not a fan of poinsettas so this is the first time I’ve had one in my home for Christmas. For some reason I’ve never really been into decorating because my apartment/dorm rooms have never felt like home. This house is definitely starting to feel like home. I even strung lights outside the house yesterday and hung wreaths on the windows and front door. I wish I could snap a photo and show you all. And I would if I wasn’t just a tad afraid of crazy people reading my blog, tracking me down, and murdering me in my sleep. Salad is obviously way better with hot soup. And wine. I’m definitely in the Christmas spirit! We have our tree up (dramatically – but it’s up) and I’m so ready to start wrapping stuff. This is really my favorite time of year – so I’m taking it in. First Christmas in the new house is so fun!! That’s when I truly felt that my house was a home. Dramatically? Uh oh, did it fall over? These are the things I worry about…kinda funny…kinda creepy. Such a cute idea! Pinterest is the best! They’re so hardy…even plant serial killers like me can’t kill them. I’ve watered it once since I bought it. haha. 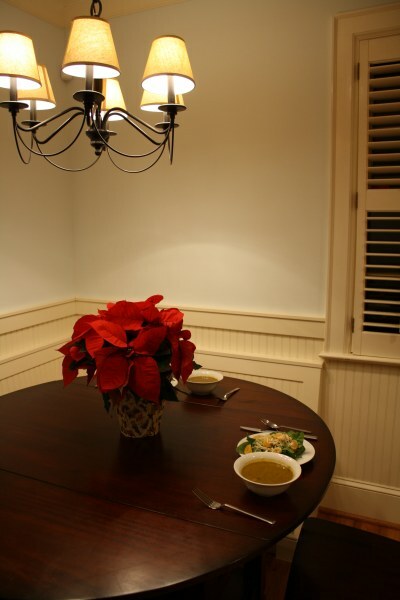 I love poinsettias! But I’m afraid to get one because I know they are poisonous to dogs. And Roosevelt, though his legs are short, somehow manages to get into everything!